Presented below are several postcards of the Wilhelm Gustloff, along with their back sides if they have been postally used. The left column will explain each postcard, while below will be the full German and English translation for each postcard. There are 60 different postcards of the Wilhelm Gustloff shown here, which doesn't include the others shown for her maiden voyage, within photo albums, etc. Some are official and others are photographs made into postcards. 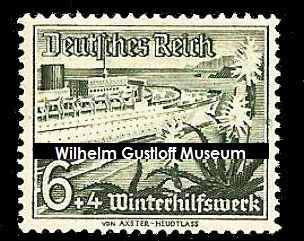 This grouping consists of 14 postcards of the Wilhelm Gustloff and their opposite sides if they have been postally used. The order of the postcard numbering at right runs the same way you would read. At the bottom of the thumbnails, the backs of the postcards are written in German, then translated to English for those who wish to gain perspective to life onboard. A special thanks to Feldgrau.com, whose members (particularily l3w & Hiltraut) translated all of the postcards for the collection. 3. KdF Postcard - Cancelled June 12th, 1938. Nothing on the backside. 4. Blohm & Voss image of the Wilhelm Gustloff. 5. Back of card. Posted August 13th, 1939- Just 18 days before the outbreak of the war. 6. Beautiful starboard shot of the Wilhelm Gustloff. 7. Back of card - Posted May 5th, 1938, the first day of her second voyage. 8. Captain Carl Lübbe Postcard with signature. Originally thought to be stamped until another was seen with the same signature but it was not exact. 9.Wilhelm Gustloff Madeira - Funchal RPPC. Nothing on the back side. 10. Hamburg - "Wilhelm Gustloff" an der überseebrücke. 11.M.S. Wilhelm Gustloff Unteres Promenadendeck. There is another set of on board postcards in this style written in 'old German' or 'Sütterlin'. This style is no longer recognized in Germany as younger generations cannot read it. 13. Back of card. Appears to bear the date September 19th, 1938. 14.Wilhelm Gustloff im Hamburger Hafen. 15. Back of card. Written September 3rd, 1942- postmarked the following day. 16. Norway - Sundalgletscher im Maurangerfjord. 17. Back of card. Posted September 2nd, 1938. 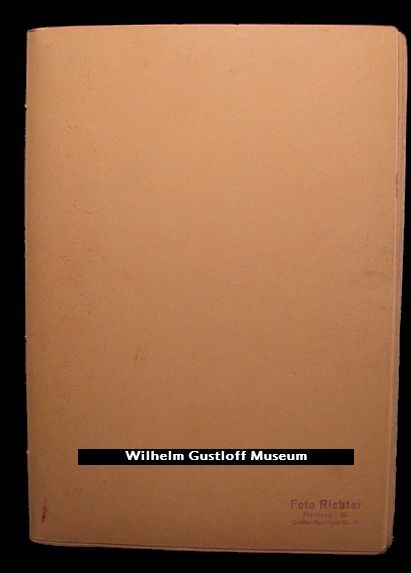 19.Wilhelm Gustloff Menu Cover Postcard. 20. Back of card. K.d.F. Schiff Wilhelm Gustloff. 22. Back of card. Posted November 16th, 1938. 24. Back of card. Written on board during her early stages of being an Accommodation Liner. Dated. May 3rd, 1941. Unfortunately, a lot of damage from when the previous owner pulled it off an album to sell. If it remained in an ablum though, odds are no one would have known the back existed. Postcards and Images 25 - 38 come from a Hamburg, Germany postcard album. Measuring 12.5" x 9", the album has 98 postcards total, several of them featuring the Wilhelm Gustloff. Cover marked 'Foto Richter, Herford i.W., Gustav-Nachtigal-Str. 41. I send you warm greetings from my K.d.F. trip to the sunny South. I take the trip around Italy. Yesterday we left from Venedig (Venice) and are now on the high sea to Sicily and Stromboli (?). Habe Dein.......... u. mich sehr ..... Ja, ......................gt, als ich las, daß...................geworden bisty. Na, da muß man ..wirklich gratulieren. ... ... ist ja wohl endlich schl... geworden und hat keine f... Führer eingesetzt. schaft! Es wäre ........ nun mal so ... und zu .... u.
Fahrt mit der Jungsturmführerschaft Pfingsten? Entschuldige bitte die Spritzer, hier fand gerade ein Wasserschlacht statt. On board the Gustloff, the 3.V.41 love Hans! Have your. ......... and me very .... Yes, ......................gt when I read, that. congratulate Kurt naturally.. Whether it with educates work out.. The essential matter is now that you you... the written stuff... .. The more at the service .... ...Mpf think! Does now it be named also.... and for the flag provide (?). ... ....Auf.. Let! Create ......bei Pentecost at. ..............führer- shaft! It would be ....... now once so... and to.... and Sch.. igkeiten have, and... works out and what out does not work! - Where is the trip with the boy storm leaderships Pentecosts going then? Sideways: Excuse please the Spritzer, as the writer apologises for the splashes. 2. Back of card. Posted August 12th, 1938. Voyage #11. 4. Back of card. Posted August 12th, 1938. Voyage #11. 6. Back of card. Posted August 12th, 1938. Voyage #11. These 3 belong with the photo collection under photo page 2. 8. Back of card. Posted October 6th, 1941. During her time as an accommodation liner. 10. Back of card. Posted May 25th, 1942. During her time as an accommodation liner. 11. M.S. Wilhelm Gustloff in Hamburg. No back. 12. Russian Painting of the Gustloff sinking postcard. Basic information in Russian on the back. 13. Another collection:Wilhelm Gustloff painting postcard. lässt alles viel besser erzählen. so schön wie letzte Woche. 14. Interesting card of the Wilhelm Gustloff 'auf der Elbe vor Blankenese. This image of the Gustloff has been cropped into the postcard to make it look like she's there sailing, but the artist's blending around the edges can be seen up close. 15. Back of Card. September 20th, 1942. During her time as an accommodation liner. Du nicht so lange warten brauchst. aufpassen, dass uns nichts passiert, toll nicht? G.
Günther is keeping an eye on us, so nothing can happen to us; great, isn't it? G.
16. Naples, Italy and Volcano Postcard. 17. Back of Card. December 14th, 1938. 18.Wilhelm Gustloff Postcard in Hamburg. 19. Back of Card. Posted March 8th, 1939out of Genoa. 21.Wilhelm Gustloff's port side at sea. 22. Back of card - Blank. In 1937, stamps were issued to support a Nazi Party "winter relief" charity Winterhilfswerk. The left stamp on this pair is of the Gustloff. It has some inconsistencies because the ship was not completed until March 1938. For example the funnel is a solid colour (it had not been installed at the time of launching in May 1937). Es geht Dir doch gut? [...] to Napoli. Then comes Genoa and back after that. I was lying on the sun deck this afternoon till 6pm. The weather is good, like at home at midsummer days. Best wishes, yours Ernst. I trust you are doing fine? 1.Wilhelm Gustloff leaving port. Ausreise. 2. Back of Card. Written: Date not visible. 3. Madeira: View of Funchal. 4. Back of Card. Written April 29th, 1938. During the official maiden voyage of the Wilhelm Gustloff. Bears the very early postal cancellation from onboard the ship, then a second from Funchal the same day. 5. Address of Luftpost card. 6. Back of Card: Written February 7th, 1939. Mailed from the Stuttgart on February 8th, 1939 to his parents onboard the Wilhelm Gustloff which was calling at the port of Naples next. The Gustloff's ticket booklets included these stickers that mail could still be received onboard the ship while passengers were cruising. One of our ticket books still has a set of these intact from a voyage. 7. The Wilhelm Gustloff's port side. 8. Back of Card: Written June 13th, 1938. Posted during her maiden voyage. 9.Wilhelm Gustloff Lounge. (Following 3 come from the same album). 10. Back of Card: Written August 26th, 1938. 12. Back of Card: Written August 26th, 1938. 13.Wilhelm Gustloff & Oceana in Hamburg. 14. Back of Card: No date visible, but written on the same voyage as the previous two. August 1938. 15. Wilhelm Gustloff at Berth. 16. Back of Card: Mailed May 15th, 1941 out of Hamburg. 17. Reprint Postcard - Women onboard the Gustloff for voting. April 10th, 1938. 18. Wilhelm Gustloffin Mauranger Fjord. 19. KdF Ship - Sierra Cordoba or Der Deutsche? from the Gustloff. 21. Passengers on the deck of the Gustloff. Photo turned postcard. 22. Group photo postcard in Madiera. 23. K.d.F. Schiff Wilhelm Gustloff Ausreise. 24. Postal stamp on the back - Mailed June 11th, 1938. 26. Back of card - Mailed May 26th, 1938. 27. The Wilhelm Gustloff at night. Very interesting view of the liner. 28. Back of card: Hard to see the full date. 29. The Wilhelm Gustloff and Robert Ley. 30. Interesting postcard of the Wilhelm Gustloff. Center flap raises and several images of Hamburg drop down. First one I've ever seen like this. 31. Painting of the Gustloff by Prof. Hans Bohrdt. A copy is in the museum collection. 32. The Gustloff in Hamburg. This card was a difficult read. It was sent from a boy to his parents on board Wilhelm Gustloff on the 7th of Feb 1939. What can be read is that he writes that he’s doing well and there’s not too much to report from his side. He’s wondering how the weather is like onboard. Further he writes something about his meals he has somewhere (during their stay on board). If he would have written in the same style as the name in the address (Julius Pfähles), it could have been read easier. However, the card went from Stuttgart to his parents, which were obviously on a cruise on Wilhelm Gustloff, which was calling a port in Naples as next.